An Orchid Mantis is something else. White and pink in color, with big petal like lobes on its body. It mimics a flower. But did you know it starts life mimicking an ant? The newborn nymphs are bright red in color with a black hat and black legs. They are shiny and bright and look simply amazing. I love the video except the ending, I think that was totally unnecessary. 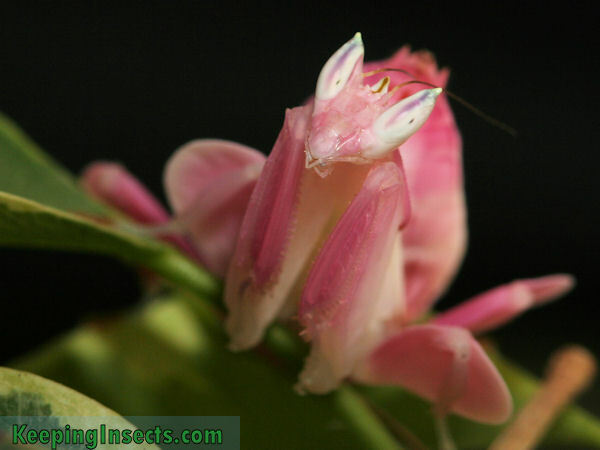 The Latin name of an Orchid Mantis is Hymenopus coronatus. You can read all about them on this page. This video shows the development of a honeybee from egg to adult bee. This takes 21 days, but the timelaps shows it in just 60 seconds. It’s really amazing to see how it works. Worth the watch! It’s spring in the Northern Hemisphere! Yes, it’s spring! At least you can feel it in the north part of the Northern Hemisphere. This means the insects are showing again. Caterpillars, butterflies, ants, and even praying mantises start to show again. If you find a caterpillar of butterfly that you would like to know the species of, please e-mail me. I’ll see what I can do. Nice pictures will be featured on the home page of this website.